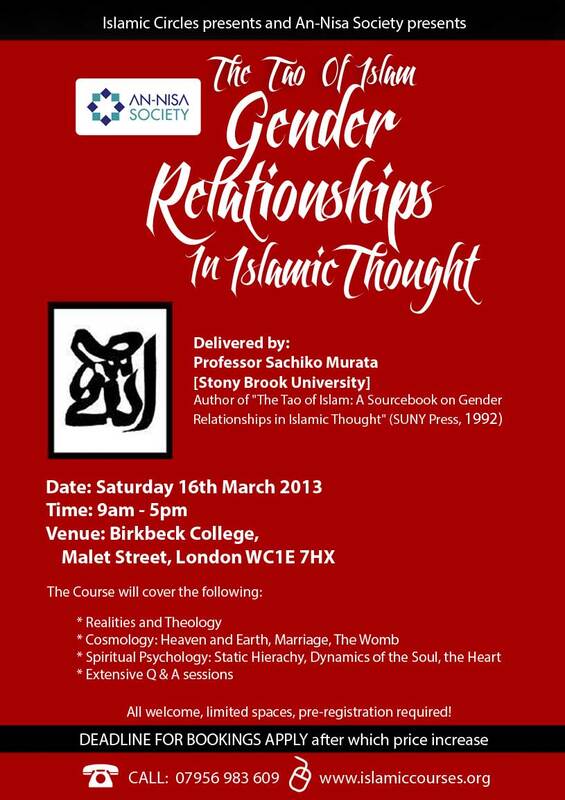 Delivered by: Professor Sachiko Murata [Stony Brook University] Author of “The Tao of Islam: A Sourcebook on Gender Relationships in Islamic Thought” (SUNY Press, 1992). The Tao of Islam is a rich and diverse anthology of Islamic teachings on the nature of the relationships between God and the world, the world and the human being, and the human being and God. Focusing on gender symbolism, Professor Sachiko Murata shows that Muslim authors frequently analyze the divine reality and its connections with the cosmic and human domains with a view toward a complementarily or polarity of principles that is analogous to the Chinese idea of yin/yang. 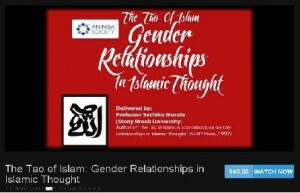 Professor Murata believes that the unity of Islamic thought is found, not so much in the ideas discussed, as in the types of relationships that are set up among realities. She pays particular attention to the views of various figures commonly known as “Sufis” and “philosophers,” since they approach these topics with a flexibility and subtlety not found in other schools of thought. She translates several hundred pages, most for the first time, from more than thirty important Muslims including the Ikhwan al-Safa’, Avicenna, and Ibn al-‘Arabi. “This is a genuine foundational work in Islamic studies. It is an open door into the very heart of Islamic civilization, while at the same time it suggests the bases of important comparisons and insights for those interested in cognate areas in Western cultures. Professor Sachiko Murata investigates the interrelationships between Islamic and Far Eastern thought, especially in the writings of the Huiru, “the Muslim Confucianists,” who wrote numerous tracts in Chinese from the seventeenth through the nineteenth centuries. Murata completed her BA in family law at Chiba University in Japan, worked for a year in a law firm in Tokyo, and then went to Iran to study Islamic law. She completed a PhD in Persian literature at Tehran University in 1971, and then transferred to the faculty of theology, where she was the first woman and the first non-Muslim to be enrolled. She finished her MA in Islamic jurisprudence in 1975, and while continuing work on her PhD dissertation in law she became a research associate at the Imperial Iranian Academy of Philosophy. Her work on her second PhD was cut short by the revolution. Since 1983 she has taught religious studies at Stony Brook. Murata has published many scholarly articles and a number of books. These include Isuramu Hôriron Josetsu (Iwanami, 1985), the translation of a major text on the principles of Islamic jurisprudence from Arabic into Japanese; The Tao of Islam: A Sourcebook on Gender Relationships in Islamic Thought (SUNY Press, 1992); Chinese Gleams of Sufi Light: Wang Tai-yü’s Great Learning of the Pure and Real and Liu Chih’s Displaying the Concealment of the Real Realm (SUNY Press, 2000); and with the collaboration of William C. Chittick and Tu Weiming, The Sage Learning of Liu Zhi: Islamic Thought in Confucian Terms (Harvard University Press, 2009. Murata has been the director of Japanese Studies since its founding in 1990 and regularly teaches Introduction to Japanese Studies, Japanese Buddhism, Feminine Spirituality in World Religions, and Islam and Confucianism..